In addition to admiring your beautiful jewelry, people may look at how you wear your rings and make inferences about your personality, relationship status, and other factors. These assumptions are based on history, cultural beliefs, and the finger you choose for your ring. Before putting on your rings, it is helpful to understand what each finger says about you and your lifestyle. Wearing the ring on the thumb means that you’re a strong person. It’s also a sign that you have some male-dominant features, like persistence and stubbornness. The thumb represents self-assertion and willpower. It is the only finger not named after a Greek god. Choose thumb rings made with carnelian, garnet, or ruby gemstones. A thumb ring on the left hand doesn’t make a statement about your relationship status, profession, or any other important part of your life. However, it is a great location for a fashion statement. Choose a chunky ring that doesn’t impede your movement, and people viewing your jewelry will see you as fashionable and confident. Similarly, a ring on the right thumb doesn’t say anything specific about you. Show off a favorite statement ring here. The ring on the index finger shows that you seek to gain more power and that you have megalomania and inclination to hysteria. This finger is named for Jupiter to symbolize self-confidence, leadership, ambition, and spirituality. Select a ring with lapis lazuli, amethyst, or blue topaz stones. The left index finger doesn’t have any set symbolism either, although it’s a good place for showing off an important ring. A ring on the index finger is sure to get noticed, so you may want to choose this finger for your class ring, a favorite cocktail ring, or another high-impact piece. In some cultures, a ring on the right index finger symbolizes marriage. According to Chabad.org, the index finger is the proper place for the wedding ring in a traditional Jewish ceremony. Typically, a plain gold band goes on the index finger of the right hand. Some brides move the ring to the left ring finger after the ceremony, but some keep it in place on the index finger. If you aren’t wearing a plain gold band, you can get away with just about any ring on the right index finger. The middle finger is considered to be the best one for the ring. It means that you’re reliable and can make good decisions. The middle finger, Saturn, stands for balance, justice, the law, responsibility, and soul-searching. Soothing stones such as rose quartz, coral, and aquamarine are appropriate for rings. A ring worn on the left middle finger doesn’t necessarily stand for anything. However, since the middle finger is central to the hand and is the longest finger, a ring on this digit can symbolize power and responsibility, if you wish. This finger is also a good choice if you want to show off a ring without making a statement about your life. Just as the left middle finger doesn’t have a set meaning, the right middle finger is open to interpretation when it comes to wearing a ring. You can choose your own symbolism for a ring on this prominent digit. Usually, the ring finger reveals whether the woman is married or not. In ancient times, people believed that there is a straight nerve that runs through the ring finger right to the heart. If you chose this finger, it means that you’re a romantic person. The ring finger represents Apollo and symbolizes relationships, creativity, and the love of beauty. Complimentary gemstones include moonstone, jade, amethyst, sapphire, and turquoise. Marital status – In most Western countries, a married person wears a wedding ring on the left ring finger. Many people think the origin of this custom stems from an ancient Roman belief that a vein travels directly from the left ring finger to the heart. 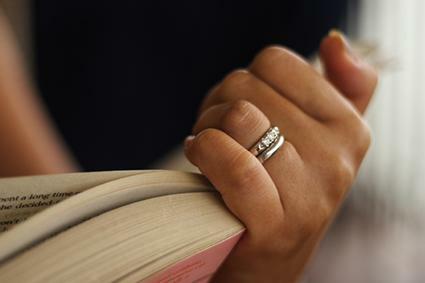 Betrothal – Similarly, a ring worn on the left ring finger can indicate that the wearer is engaged to be married, a tradition believed to date back to the time of ancient Romans. At the time of the wedding, the bride may choose to continue wearing her engagement ring on the left ring finger with her wedding ring or switch it to another finger. Romantic promise – Some people choose to wear a promise ring on the left ring finger, although this is reserved for serious romantic promises. Chastity – Many young people also choose to wear a chastity ring, or purity ring, on the left ring finger. This is to signify an abstinence from intimate relations until marriage. Although many cultures reserve the left ring finger for wedding and engagement rings, there are also several countries that use the right ring finger for the same purpose. These include Germany, Russia, India, and many others. The ring on the pinky is a sign that you’re an extraordinary person. By wearing the ring on this finger, you’re proven to be artistic and creative. Mercury rules the little finger, which stands for intelligence, communication, persuasion, and intuition. Pick rings with stones such as moonstone, amber, or citrine. From signet rings to wedding bands, a ring on the left pinky finger can symbolize a number of different things. Marital status: Two rings on the left pinky finger once indicated that a man was married. The bottom ring was the wedding ring, followed by the signet ring on top. Popular during the 19th and early 20th centuries, this custom has since fallen out of favor. Some historians believe that American president Franklin D. Roosevelt wore a wedding ring and signet ring in this fashion. Men’s Signet Ring Mafia connections: Pinky rings, on either hand, are sometimes associated with the culture of organized crime. Dramas like The Sopranos have further popularized this image. In addition to some of the same meanings as a ring worn on the left pinky, a right pinky ring can also indicate professional status. In some professions, particularly engineering and ecology, a pinky ring is a symbol of graduating with a degree in that field. 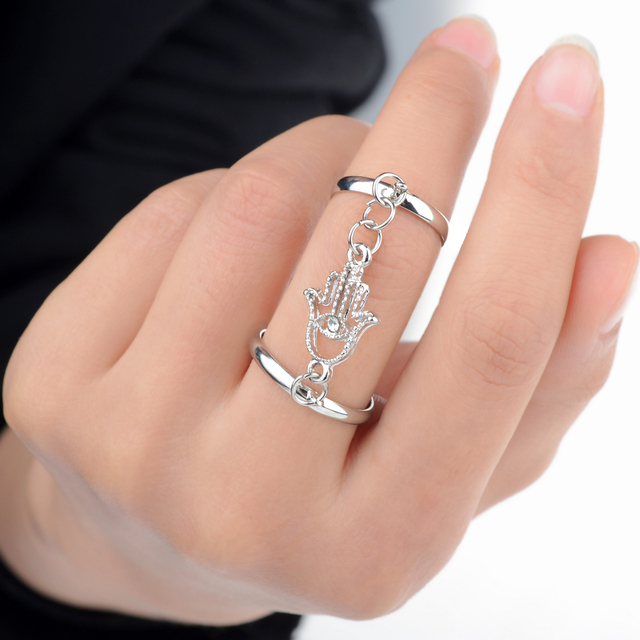 Graduates wear this ring on the dominant hand, which for about 90 percent of people, means the right pinky finger. Professional rings are typically simple bands made of iron, silver, stainless steel, or another metal. These days, choosing a finger for your ring is mostly a matter of personal preference. However, it’s important to understand what your ring placement says about you to other people. That way, you can make an informed choice about which finger you choose to display your ring.